Cataracts are a common part of aging– so much so that many people consider cataracts normal. According to the National Eye Institute, by 80 years old, more than 50 percent of United States citizens have developed at least one cataract. While cataracts may be considered “normal,” they tend to grow progressively worse and can cause significant vision impairment. If your elderly loved one is experiencing any changes in their vision, it’s important to talk to their doctor about what options may be available for them. For everything you need to know about cataracts, including symptoms, causes, types, and more – start here. The lens of the eye consists of clear tissue that focuses light on the retina, which is the layer of nerve cells that lines the back wall of the inside of the eye. It’s here that light is converted to nerve signals that communicate information to the brain. Cataracts are when clouding occurs in the lens of the eye, causing changes to your loved one’s vision. For people who have cataracts, seeing through cloudy lenses is a bit like looking through a frosty or fogged up window. Age-related Cataracts: The majority of people with cataracts have age-related cataracts. Congenital Cataracts: This type of cataract occurs in babies and young children and may be caused by a variety of different factors. Nuclear Cataracts: This type of cataract affects the lens and tends to cause yellowing and clouding. Cortical Cataracts: Cortical cataracts affect the edges of the lens and tend to cause white marks and streaks that extend to the center of the eye. Secondary Cataracts: This type of cataract is caused by diabetes or drugs like corticosteroids. Traumatic Cataracts: Cataracts can occur when the eyes are injured. Cataracts can occur following the incident or years later. Posterior Subcapsular Cataracts: This type of cataract affects the back of the lens and tends to cause a small opaque area in the path of vision. Posterior Subcapsular cataracts often progress faster than other types of cataracts. Most cataracts develop slowly and do not disturb the eye-sight early on. The first symptom of a cataract is a small area of blurred vision. With time, this area typically grows as the lens becomes more clouded. This can create the sense that your loved one’s overall vision is blurry or dull. Certain colors, especially blues and purples, may start to appear differently. In addition to vision changes, your loved one may notice cloudy and blurred vision, difficulty with night vision, sensitivity to light and glare and halos around lights. Sometimes cataracts can cause the lens to take on a brownish or yellowish hue. The lens of the eye is mostly made up of protein and water. The proteins in the lens are arranged in such a way that it helps keep the lens clear. But as we age, the proteins change and can begin to clump together. When this happens, it can cause cloudy vision. As time goes on, these clumps can grow in size, affecting a larger area of vision. While most people develop cataracts as a result of aging, some people are born with cataracts or develop cataracts in one or both eyes during childhood. 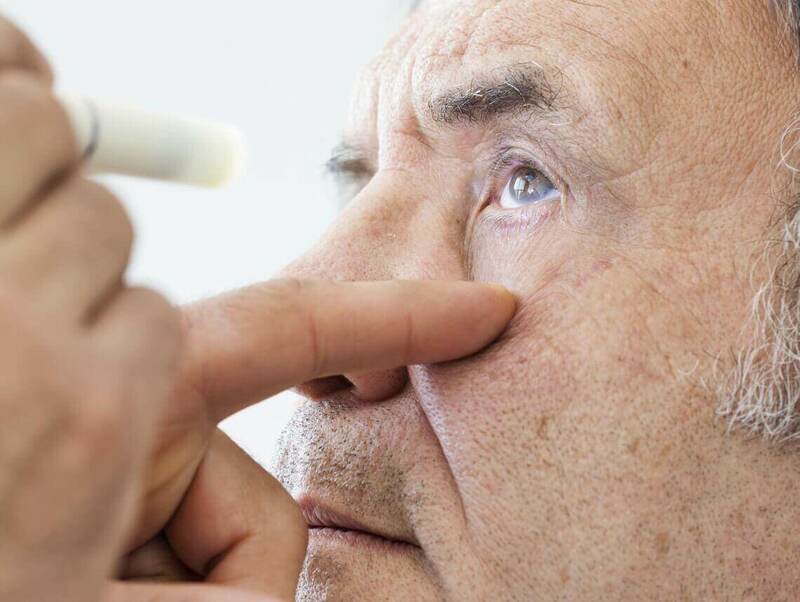 These instances of cataracts are often caused by conditions like myotonic dystrophy, toxoplasmosis, syphilis, herpes simplex virus, and rubella. Cataracts are typically diagnosed by an optometrist, ophthalmologist, or another eye specialist. A variety of eye and vision tests such as a visual acuity test, slit-lamp test, or dilated eye exams may be used. When it comes to preventing cataracts, there isn’t a one-step approach. There are however a number of lifestyle measures your loved one can take that can help keep cataracts at bay. Have regular eye examinations to detect cataracts and other eye problems at their earliest stages. This includes things like making sure your loved one is wearing sunglasses that block UV light when they are outdoors. If your loved one has diabetes or high blood pressure, emphasizing a healthy diet can help prevent cataracts. As always, quitting smoking and keeping alcohol consumption to a minimum is a good idea for both eye and overall health. The only way to effectively treat cataracts is with surgery. Surgery replaced the lens in the eye with an artificial lens. After your loved one is diagnosed with cataracts, it’s rare that surgery is needed right away. Sometimes surgery isn’t always the best option. Ultimately, the decision to have surgery will depend on your loved one’s overall health and how much the cataracts are interfering with their daily life. If your loved one can still go about their normal day with relative ease, it may be best to avoid surgery. Your loved one’s doctor will be able to help determine what the best course of action is. If they decide to have cataract surgery, the doctor will go over what to expect before, during, and after the procedure. If your loved one is over 60, it’s in their best interest to have an eye examination annually. But if you’re a caregiver juggling duties at home and work, it’s difficult to provide loved ones with the necessary level of care.